I imagine a lot of people decided a few weeks ago that they were going to start eating healthier. With the new year comes a renewed determination to be as healthy as possible. Then, a month later we are invited to a huge football game party only to be tempted with fattening fried foods and snacks loaded with calories. I don’ t know about you but I am weak! When I head to a party I like to bring something healthy that I really enjoy eating. That way, the temptation to eat junk food is a tad bit less! This easy spring roll recipe is loaded with fresh vegetables and the dip uses Naturally Fresh Ginger Dressing. Naturally Fresh Ginger Dressing is a unique Asian style dressing with a delicious taste of ginger. It contains no artificial colors or flavors and no artificial preservatives. Naturally Fresh dressings are the perfect way to fit an almost homemade taste into our very on-the-go lifestyle. I love cooking from scratch but I am always happy to find a healthy short cut when I am in a hurry! 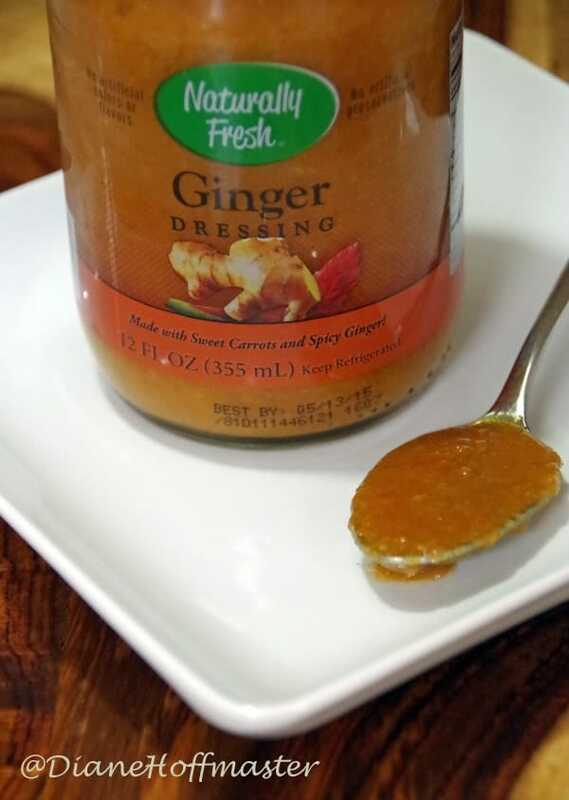 I found this particular Naturally Fresh Ginger Dressing at my local Asian market but they have a great selection of dressings at both Kroger and Publix as well. Spring rolls are very flexible when it comes to the vegetables you tuck inside. I saw recipes that included mushrooms, tofu, and julienned cucumbers. You can certainly play around with your spring roll recipe to find just the perfect combination of flavors. The dipping sauce is very simple to make…just add a touch of soy sauce, green onions, sesame seeds and sesame oil to the Naturally Fresh Ginger Dressing and whisk with a fork. Very quick and easy. 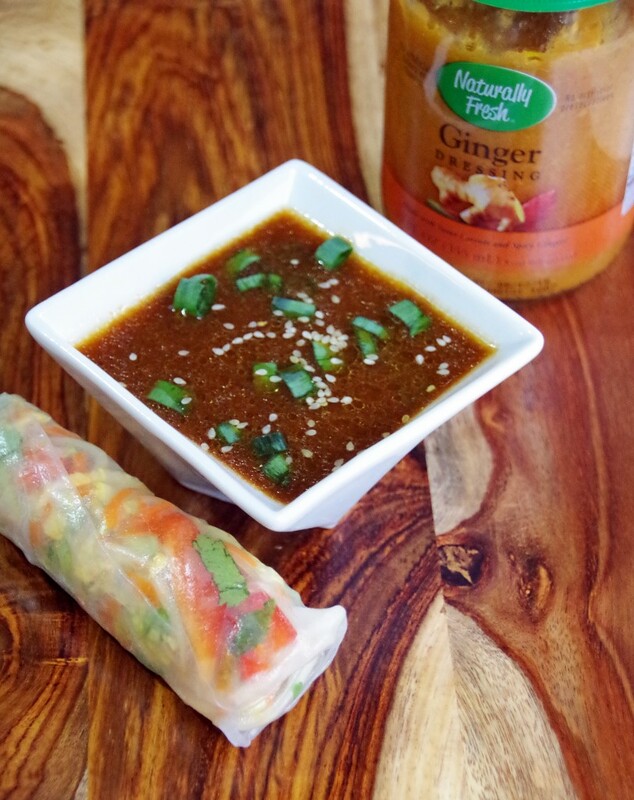 The fresh taste of ginger really shines through and makes this spring roll recipe absolutely heavenly! Looking for more appetizer recipes? Check out my Chicken and Ranch Taco Cups! Prepare rice paper wrappers according to package instructions. 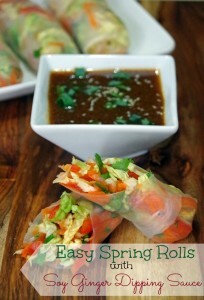 Let spring rolls sit under plastic wrap while you finish rolling them. into a small bowl combine the Naturally Fresh Ginger Dressing, the soy sauce, and the sesame oil. Whisk to combine. Pour into serving bowl and top with green onions and sesame seeds. Naturally Fresh would like to provide one of my readers with 5 free product coupons so they can try out this delicious line of dressings for themselves. This is a Giveaway Tools contest so follow the direction in the form below to enter to win! I love chicken wings, samosas, and shrimp cocktail. My favorite party food is chicken wings and chips! I love trying new things as well so I will be trying these! i like spring rolls, hummus, chips, and salsa. My favorite are mozzerella sticks. I can eat them until my stomach explodes. Buffalo Wings. OR my buffalo chicken dip! I like to serve a veggie tray, chips and salsa and wings. I love chips with dip!! I have had a lifelong love affair with Spinach Dip. I love cheese balls with almonds and onions. My favorite party food is potato wedges, yum! I love buffalo chicken dip and other dips! My favorite party food is crab dip. My favorite party food is veggies with curry dip. I like buffalo chicken dip. I love grilled lamb chops. I am classic, I love hot wings and blue cheese! This looks incredibly yummy! I'll be on the lookout for some ginger dressing and I'm pinning this recipe for later! Thanks for the post! Can't wait to try it. My favorite party food is BBQ Chicken Wings dipped in ranch dressing. My favorite party food is the veggie platter. My favorite party food is a nice cheese tray. My favorite party food is nachos with a bunch of assorted dips! I love homemade soft pretzels with some cheese! I love all the unhealthy food that I rarely allow myself like mozzarella sticks, potato skins and chips and dip. Nachos and pizza are my favorite party food. Chicken wings, chips & guacamole and pizza top my list.